This is a very interesting and educative topic entailing the cultural dynamics of different communities regarding beauty and appearance. Plastic surgery has become so standardized that everyone talks about it. Instead of “where did you get your designer handbag?” people might ask you where you got your chin, eyes or nose done. To understand these insights, two sources of information will serve as the basis for ideas of the authors about plastic cosmetic surgery. The article by Alexander Edmonds titled, “‘The Poor have the right to be beautiful’: cosmetic surgery in neoliberal Brazil” discuss the dynamics of the cosmetics industry in Brazil over the last two decades. He focuses on the poor population of Brazil that has recorded a high rate of plastic surgeries, and that has been influenced by the diverse social origins of the general population. According to Edmond, poor people in Brazil have judged their appearance from different social origins as an “aesthetic defect”. The beauty industry, therefore, became a solution to the problem by diagnosing and treating it through plastic surgery. He cites a racialized “beauty myth” in clinical practice and marketing as one of the main motivators for the pursuit of plastic surgery. Outward appearance affects social mobility, glamour, and an individual’s association with modernity. By having plastic surgery, poor people believe that it gives them the means to compete in the Brazilian neoliberal economy. In Edmonds’ perspective, the capital flows of the modern capitalist economy are to blame for the commercialization of beauty and the absence of regulations in the cosmetic industry. The poor are simply doing so to achieve a class body that society has unknowingly decreed as the quintessential appearance of a person who fits in a higher social stratum. It is a way of trying to assimilate into mainstream Americans. For instance, many want to brighten their eyes a little a bit without altering their ethnic appearance. Others want their nose reshaped just to look better than they think. All they want is to retain their natural looks, but bridge them with the mainstream American appearance. I personally agree with her on the fact that more and more young Asians are getting their faces done. People in younger generations, who are in middle school or high school, and also their parents, accept and believe that earlier they get ‘work done’, the more natural look they look they will have as they grow. And it is very common nowadays get plastic (cosmetic) surgery as a graduation or birthday gift from adults. Both insights from Edmonds and Bagala, have one thing in common: the tendency of plastic surgery seekers to conform with ‘appearance myths’ in their respective societies. Appearing in a way that conforms to the ‘myth’ improves the seekers’ self-esteem as they move up the social ladder or attempt to fit into contemporary culture. As long as plastic surgery continues to be a psychological issue largely influenced by the ethnographic differences of the society, it is likely to may not end soon. Furthermore, it is also bolstered by the market economy with massive influential marketing techniques. It is quite difficult to regulate the cosmetics industry without infringing on people’s rights on their bodies. Edmonds, A. (2007). The poor have the right to be beautiful: cosmetic surgery in neoliberal Brazil. Journal of the Royal Anthropological Institute 13:363-381. Since our generation has been in school, teachers, the media and so on often say that “Globalism is important and you guys might to be an global person.” On the other hand, the definition of globalism and globalization are very vague and huge. Actually I still do not know what globalization is. In addition, Japan often said that we are not globalized and we need to be hurry and adapt globalization. However, accepting globalization is really important and do we need to be so? The specific example is mobile phone. For a long time, in Japan many people use normal mobile phone. Main work for them is calling and sending text in special way, which using e-mail address. On the other hand, the other countries such as the U.S., the U.K. and Korea, sending text through the telephone numbers was most popular. The introduction of smart phone was delayed both spreading and developing even though Japan was one of the most famous countries for these technologies. Some people said that Japan need to catch up and develop more and more. In here, the problem is that is it important to catch up to other country or not. Of course, we sometimes need to understand what is happened on the earth and think about problems. However, in Japan, even though some says that some realize and move towards, most people are not move and do not understand the importance of that. Changing people is very difficult about knowing importance is more difficult. Globalization is recently speed up and some are confusing about that fact, however, cherishing and knowing our own culture and learning about different way of thinking and view will be help understand one of the best way to what is globalization and how to survive international society. Coming in at US$180 million in 2011, Kpop (Korean pop) has become South Korea’s largest export. After watching a handful of Kpop music videos, it’s not hard to see why it’s become known as Hallyu, or the “Korean Wave“: every music video I watched had addictive beats and perfectly synchronised choreography, and it’s hard not to be mesmerised by a group of twenty year-olds with six-packs and make-up a la B2ST, or the perfect faces of SNSD, all with button noses, delicate, pointed chins, and big, sparkly eyes. Kpop’s main target market are teenagers: teenagers from France to Fiji, Australia to Austria have succumbed to the Korean Wave. Due to the clever utilisation of the internet to market Kpop, entertainment companies SM Entertainment, YG Entertainment and JYP (known as the “big three”) have helped create an entirely new generation of teens who sing lyrics they don’t understand. But Kpop has created a new trend: cosmetic surgery. This year’s contestants for the Miss Korea contest look starkly different to the contestants just 30 years prior. 30 years ago Miss Koreans had a very different face: slumberous, slanted eyes, a round face and a wide nose. In exchange for these features, the Miss Korean contestants today have large, double-lidded eyes, a pointed chin and tiny, pointed noses. The same look can been seen, replicated again and again in the Kpop industry. Children as young as nine or ten get recruited by entertainment companies, in which they are signed into 10-15 year contracts: it is no big secret that along with this, new recruits are contractually obliged to have plastic surgery to “improve” their image and become more sellable. In other words, these children are moulded and manufactured, ready-made and sold globally for company profit. In an interview with Kpop group D-Unit, Charlet of Vice asks what the ideal Korean beauty is: one girl answers that ideally, Korean beauty would be that of Westerners, because of its “distinctiveness”. “Big round eyes, straight nose and round face”, the D-Unit member says. Has this become the template for beauty in South Korea? The “Western” face? The advancement of cosmetic surgery technology and techniques means that this Western look is readily accessible, and attainable. In a nation increasingly becoming obsessed with notions of Western beauty, boosted by the Kpop industry, one in five South Koreans have turned to plastic surgery, as opposed to one in twenty people in America. Parents in South Korea are helping to encourage the importance of beauty in their society: as a middle school or high school graduation present, instead of luxury goods, it is now quite common for parents to foot the bill for their children’s plastic surgery (typically, double eyelid surgery). Supposedly, this is meant to increase their child’s chances of getting into a prestigious high school or university. It is not only teens who are affected by the cosmetic surgery: some employers make recruiting selections based on physical attractiveness. If Western phenotypes are the ideal Korean beauty, then those who have undergone cosmetic surgery would be the people getting the jobs: such hiring techniques resembles the employment patterns of companies, who give preferential treatment of White people over other types of people. Kpop is much more than South Korea’s largest export: besides influencing plastic surgery tourism, endorsement deals with a variety of Korean products have helped stimulate the country’s economy, and the deification of Kpop stars has also boosted agriculture. Worshipping teens will make donations of rice at music concerts in order to feed their idols. With so much socio-economic profit, it doesn’t look like the Kpop and plastic surgery will come to an end soon. 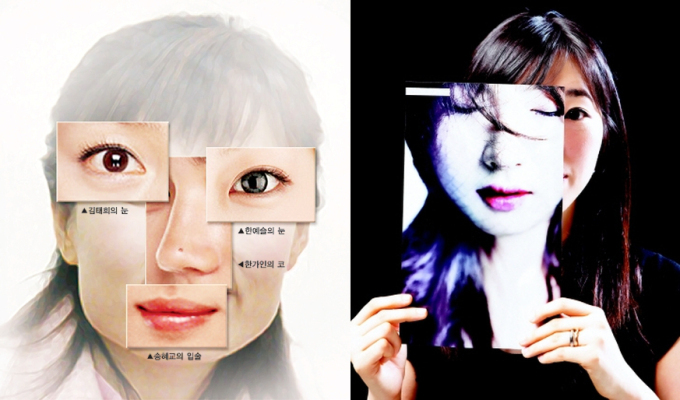 Kpop has become the “face” of South Korea, whilst their real faces are hidden behind more than a nip-and-tuck. If South Koreans keep turning to plastic surgery as the answer to their problems, constantly Westernising themselves, they are only telling themselves that White phenotypes are the only type of beauty. Furthermore, they are ethnically cleansing themselves psychologically and physically through plastic surgery. Calhoun cites references on China, relating how anti-Japanese imperial protest, the May Fourth Movement in 1919, was both anti-imperialist and served to strengthen and democratize China. This was later to have led to the revolution. It seems as Korean nationalism has beeb strengthened through protest against Japanese policies. Recently, the Korean president refused to negotiate with the Japanese because Japan refuses to apologize for its wartime actions. One of my Korean friends told me that he cannot talk about the history of his country without talking about what Japan did when it controlled Korea from 1910 to 1945. Symbolically, Yasukuni can be thought of as a wormhole that goes through time and space. When this wormhole crops up, the entire Korean nation seems capable of being transported backward into the era of Japanese colonial rule. 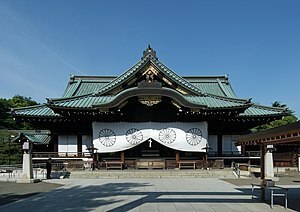 Jouhki says that the Korean image of Japan is as she was in the colonial period, and Yasukuni represents imperial Japan just as if it were now. The image exaggerates the difference between us and them, Korea and Japan. He says that when the Koreans were colonized, it made the Koreans see themselves as “Other”, just as they saw the Japanese as “Other”, and Yasukuni represents an identity that they are trying to work through. Japanese leaders’ nationalism, such as visits to Yasukuni Shrine and the museum and textbooks that fail to show wartime atrocities, is not only a means to form a certain Japanese identity. It seems that Japanese nationalism strengthens a certain Korean identity as well. Calhoun, C. (1993). Nationalism and ethnicity. Annual Review of Sociology, 19, 211-239. Look Good, and Get a Job? One thing I have personally noticed recently while attempting to write curriculum vitae both in English and Japanese is the requirement of attaching a photo on Japanese CV. It was actually a refreshing shock for me that photos – like the type you would attach for passport application – were not a requirement at all when writing a CV in English. I think this may have originated from differences in cultural practice whereby in Japan, more emphasis is put on how ‘appropriate’ and ‘decent’ you should appear. This idea that appearance is quite a big matter in such formal processes as recruitment procedure, however, can result in much more pervasive outcome than simply putting a little more effort in ironing your suits. In South Korea, the ultra-competitive job market has encouraged so many young college graduates, females in particular, to go under knife of cosmetic surgeons. How has the competitive job race related to the increasing popularity of, and almost-blindsided trend following cosmetic surgery? With much vulnerable and unpredictable economy conditions, it has been more and more widely believed that good looks give you an edge in securing jobs or marriage. According to an article in one mainstream English-language newspaper in Korea, over a quarter of college students are said to consider cosmetic surgery for this reason, according to a recent survey by an online career portal site (Kwaak, 2013). In one survey of over 600 job-seekers, conducted by one clinic reported that around half of the job seekers are getting surgery exclusively to get a job, including non-operational procedures such as Botox or filler injection (The Chosun Ilbo, 2009). Unfortunately for recent graduates, it is increasingly becoming a very common conception that such procedures are now being perceived as “investment” before entering a competitive race to market yourself better, for your own sake. Amongst the tide of young women receiving the procedure, those unable to afford, those with physical disabilities or with a darker skin are excluded further (Kwaak, 2013). Many of cosmetic surgeries’ ultimate aim is to give the patients certain types of features that are distinctively considered ‘beautiful’ by the set ideal of beauty as perceived in South Korean society today. The definition of ‘beauty’ here is closer to a Caucasian face. One Korean cosmetic surgeon, in a comment on what has been the most demanded facial ‘type’ by patients, said that “(t)hey are seeking to have westernized face, high profile nose, slender nice cheekbone, and mandible bone” (Lah, 2011). In the chapter “A Colorstruck World” in Shades of Differences, Verna M. Kieth argues that complexion operates as a form of social capital that can be converted to human capital assets (p. 29). Just as light-colored skin is more preferred than darker skin in many aspects in the American society, in case of South Korea, the most-frequent judging standard by which preferences are given is the Westernized standard of beauty. Having phenotypes and skin tone that fit this standard, even by going under knife, are ‘rewarded’ with more stable job opportunities. Whether this hypothesis is true or not will be very difficult to attest – yet it will act like a self-fulfilling prophecy, an ‘assumed truth’ as long as people believe in it. Kieth, V. M. (2009). A Colorstruck World. In E. N. Glenn (Ed. ), Shades of Difference (pp. 25–39). California: Stanford University Press.